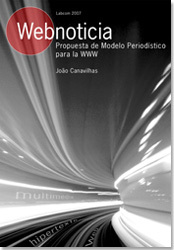 João Canavilhas, professor of the University of Beira Interior (Portugal) has published a book: Webnoticia. Propuesta de modelo periodístico para la WWW [Webnews. A proposal of a journalistic model for the WWW]. Although the book comes from Portugal, it is written in Spanish language. Professor Canavilha has some articles on this subject in English as well. The book is accesible in pdf format by University of Beira Interior’s LabCom, a research group conducted by professor António Fidalgo. They publish all their books, with ISBN and professional format, as e-books, and offer as well the possibility of purchasing a printed issue. The book has two parts: theory and experiments. The author makes in the first part a state of the art of the characteristics and research done on multimedia language and the news, and explain the metholodgy proposed for his study. In the second part, he explains some experiments done around two concepts: hypertext and multimediality. Finally, based on the syntax of hyperlinks, Canavilhas proposes a multimedia grammar for online news. based on four levels: basic level, explanation level, background level and exploration level. The proposals were applied to the experimental online newspaper of João Canavilha’s own University in Covilhã, http://www.urbi.ubi.pt/.